There's not much to report on the book front at the moment except to say that the editing process will soon be underway. To my relief all the designs arrived safely at the publishers last week and my editor will soon begin the editing process. There should be more on that front in September. 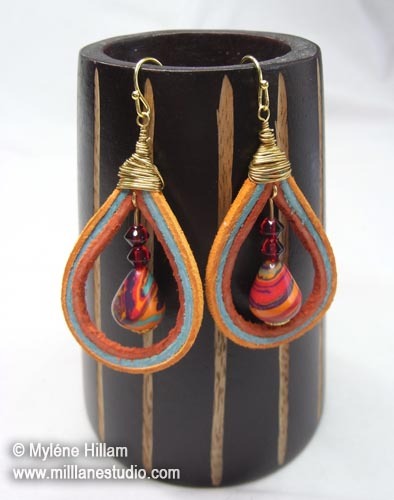 In the meantime, here's a simple Sof-suede lace design to whet your appetite for what's in Stylish Leather Jewelry. Hope you like it! 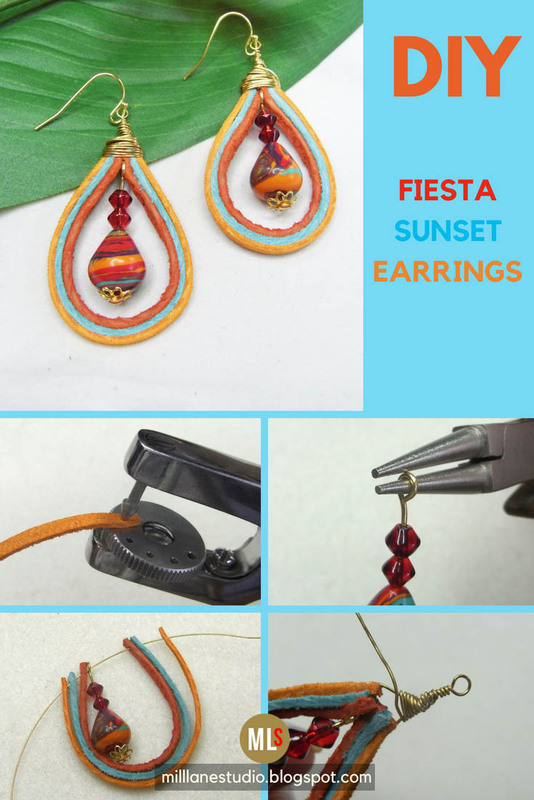 Cut the suede lace to the following lengths: Rust 90mm (3½”); Aqua 95mm (3¾”); and Orange Peel 98mm (3⅞”). 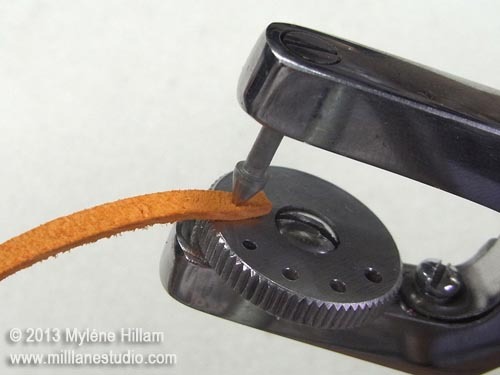 Use the ruler and marker to measure ⅛” from each end of the three laces. Punch a hole at each mark. 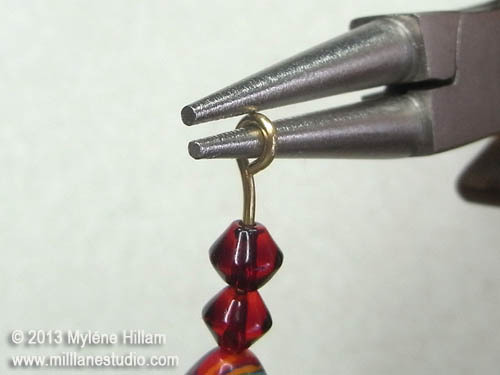 Trim the head pin to 1 ⅜” and string a bead cap, a tear drop bead and two red bicone beads. Create a loop at the end of the head pin. N.B. There will be a gap between the loop and the top bead. Cut 14” wire and thread on one end of the Orange Peel lace, the Aqua lace and the Rust lace. 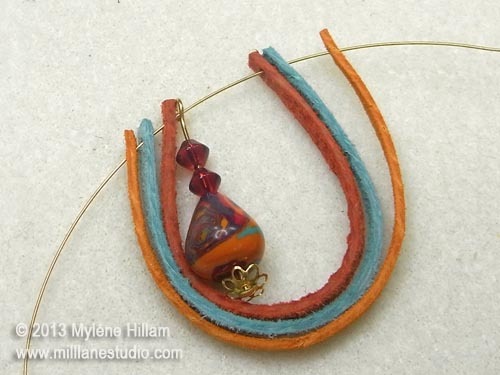 String the loop of the beaded head pin and then the tails of each of the three laces. Move the laces to 1” from the end of the wire and bend the wires on either side of the laces so that they cross over each other above the laces forming a triangle. Wrap the short tail around the long wire twice and trim away the excess. 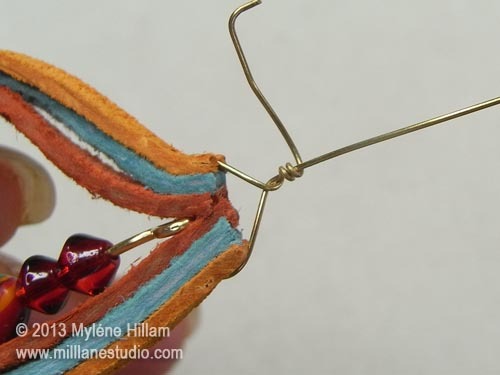 Leave a gap of approximately 1/8” above the wire wrapping and create a loop with the round nose pliers. 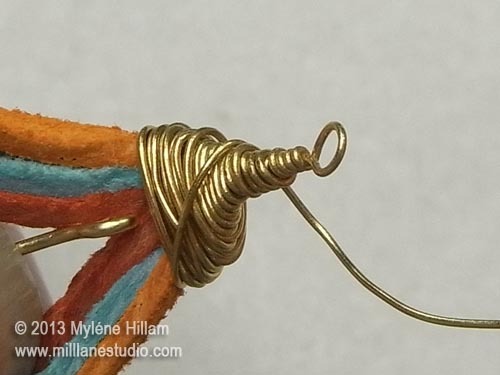 Wrap the wire down the neck and over the coils. Continue wrapping it down the triangle and across the top of the laces until you cover the holes in the laces. Take the wire back up to the neck and wrap two or three times to secure. 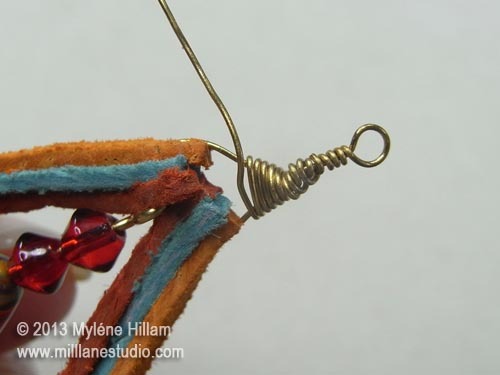 Trim away the excess wire and then hook the eye loop onto the earring wire. Make a second earring to match. Use a pen to mark where you want the hole and then line the needle point of the multi-hole jewellery punch up with that mark. Before punching it, make sure that the lace is centred and sitting perfectly flat. Then squeeze the handles to make the hole. If you look at the second photo above, you can see that there is just enough width to punch a 1mm hole. I highly recommend this tool to do that. If you don't have access to a multi hole jewellery punch, try using something like a needle tool. Lay the leather on a piece of wood or a self healing craft mat and poke the needle tool through the lace. You only need a hole wide enough to accept 26g wire.